Q: I cannot get a mapped drive to stay mapped after a logoff in Windows 7. Whether I map the drive by right clicking My Computer or by the command prompt (net use f: \\sharename /persistent: yes), after the user logs off or reboots, the drives disappear. This is only happening to the users on Windows 7. We have no problems with the users on XP. Anyone have any idea? I've tried logging in with different usernames, disabling third-party client firewalls, disabling UAC, etc. That will change the system setting for the user to make the drives remembered all the time and will be the default action. If the above is not the case, then map the drive through the Command Prompt and see if the mapping is remembered. You may change the drive letter R: above to any free letter you wish. However remember that if you use a letter that is too close to the beginning of the alphabet you may overlap with USB devices and then one or the other will be missing. You can replace the R: with * and it will start with the next free drive letter starting at the bottom of the alphabet. That should make the system remember the drive through logoff and reboot. The long-term fix is a registry edit that will make mapped drives visible in both standard and administrative sessions. 2. 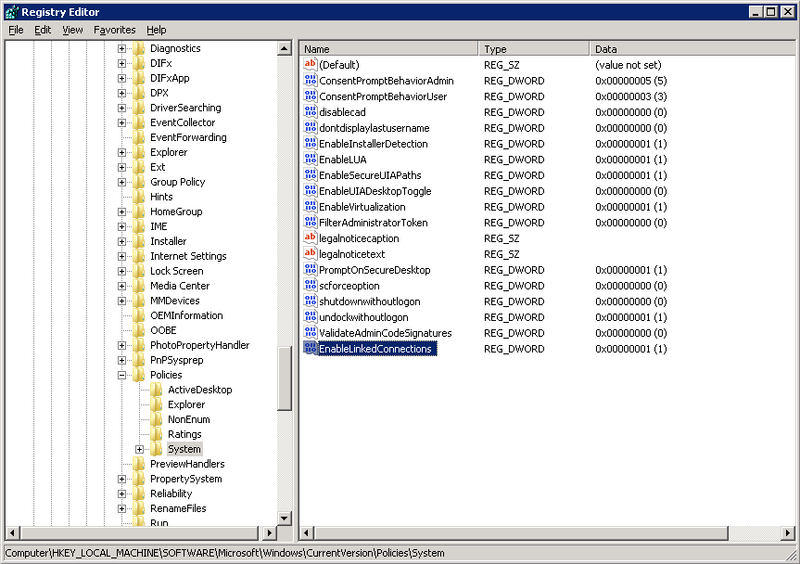 In Regedit, navigate to HKLM//SOFTWARE//Microsoft//Windows //Current Version//Policies //System. 3. Create a new REG_DWORD entry named "EnableLinkedConnections". See sample screen below. 4. Set its value to 1. 5. Reboot after adding the registry entry and programs will be able to see mapped drives forever. "How to back up and restore the registry in Windows"